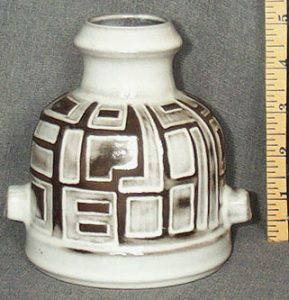 I’m increasingly frustrated by how poor some of the early research into West and East German pottery turns out to be, but I’m also frustrated that changes in information are often not widely shared, just in whatever group they first get revealed in. I would love to be doing my own research, but the necessary materials remain in Germany, leaving me to rely on those people in Germany who research the subjects. Ralf and Gudrun Unterstab vase, circa 1970. Unterstab, while the simple KTU mark was Kerstin, their child. Not much more information seemed to be available. 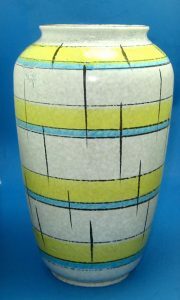 So I get the lovely crystalline glaze vase pictured here and decide to ask for a few more details and confirm some information. 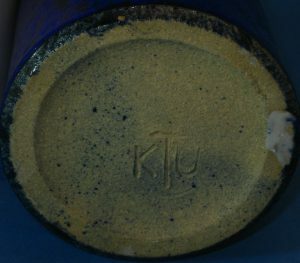 It turns out that KTU stands for Kunsttöpferei Unterstab (translation Unterstab Art Pottery), and not only is it not by Kerstin, but there is and never was such a person. Just how bad does research have to be to create a person who never existed just to match letters in a name? I apologize to anyone I ever passed that information along to. While I know where I got the wrong information, I don’t know if that was the “source”, so I’ll leave that be for now…but a lot of wrong and very wrong information has come from that same route. So Unterstab pottery is Ralf and Gudrun (which I think is still accurate). Luckily, this vase, which I believe is circa 1970, is just as lovely since good or bad research affects only the attribution, not the aesthetics. If you reached this blog without going through the main site, you can get there by clicking here ginforsodditiques.com to see more information plus items for sale. I still consider the introduction of the Ruscha shape 313 in 1954 to be the beginning of the golden age of West German pottery. The Kurt Tschörner from was elegant, whimsical, daring and a delight to the eye with its spout thrust forward and every line following that forward line. It captured everything that the post-war pottery seemed intent on doing, lifting spirits and looking forward. I’ve been pushing the 313 as an icon for over a decade, and the idea has caught on. There is, however, a problem because there are two versions of the 313. The original 313 form with its low, forward shape and a sharp angle where the handle meets the throat. grabbing the top of the vase and pulling upward. 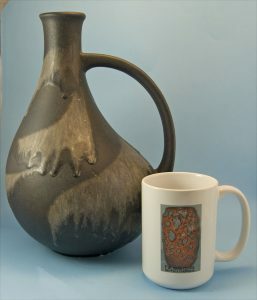 The resulting “pitcher” is not only a bit taller but a bit less “forward”, less elegant, less whimsical. 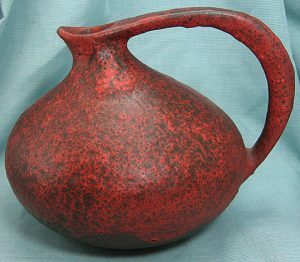 So why change what seemed to be one of the perfect art pottery forms? I suspect that the answer is an old one, commerce. The redesigned Ruscha 313, less forward thrust and room to fit a finger under the top of the handle. 313 special would almost certainly have made it difficult to produce. Several of the angles were such that they probably didn’t come out of the mold well on a regular basis. That would mean some were lost then, while others would require additional hand sanding to be worth glazing. Also, the handle was probably prone to breaking somewhere between the kiln and the store shelf. If you got here without going through the main site, you can get there by clicking here: ginforsodditiques.com. 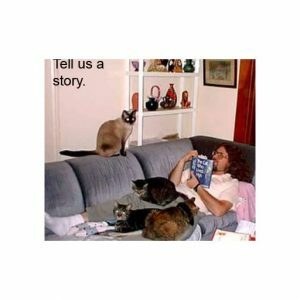 You’ll find more information plus items for sale…not just the usual suspects. Horst Makus and Kevin Graham have both published extensive lists of shape numbers and height combinations and which companies produced them. You may also get results simply by entering a shape number and size into a Google search. However, the lists and searches can be deceptive. Aside from the issues of accuracy (and much of the information on the net is out of date or simply wrong), many companies re-used shape numbers. 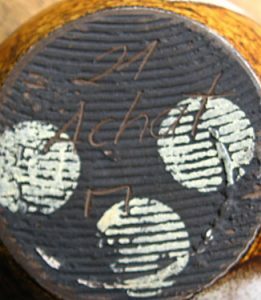 Since Scheurich produced tremendous quantity for most of the W. German era, many glazes, many shapes, and many sizes, they were the “worst” about re-using numbers. After all, they had the choice of going up and up in shape numbers or re-using numbers. 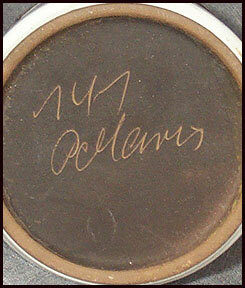 Companies often used particular series for particular shapes (such as something in the 800 range for non-handled vases by Ruscha for many years), it was more convenient for them to re-use numbers. After all, companies weren’t concerned with what would help or hinder collectors decades later. So a Scheurich 201, 275, 414 and others may appear in two, three, even four shape variations. In some cases, the shapes are quite similar. With two versions of shape 275, the primary difference is simply whether the top of the handle is curved (earlier version) or straight. In other cases, the the shapes bear little resemblance to one another. We’re taught to trust numbers, those things that supposedly never lie, but when collecting West German pottery, keep in mind that even if the numbers don’t lie, they can certainly be deceptive. When trying to identify W. German pottery, numbers, glazes, forms, clay color, even the style of the numbers and their placement should all be considered before declaring, “I know who made this one.” Even then, mistakes can be made. I know. I’ve made at least one or two….or so. 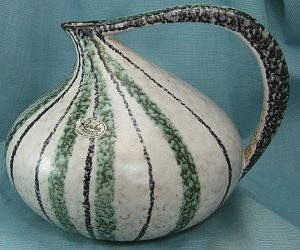 For more information and items for sale, visit http://ginforsodditiques.com, not just the usual suspects. 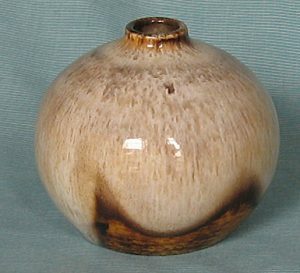 Bodo Mans is one of the few designers who had established some reputation before he designed for a West German pottery company, and collectors were seeking his works for Bay years before W. German pottery became a popular collectible. Indeed, some of them sold higher then as Bodo Mans items than they do now as Bay or West German. Although this early popularity has not translated into higher prices today, it has certainly become a hot keyword with the usual results. Based on information in the Horst Makus books, there are a few decors in the early 1960s attributed to Mans, including Reims in 1960, Istanbul in 1961, and Ravenna, also 1961. I believe some others in that era have also been documented, but I’m not certain. Unfortunately, not all the information people have managed to gather has been widely shared, much less published. However, there are far more items wrongly attributed to Mans than rightly. It seems that every embossed design gets attributed to Mans, even if it was designed after Mans had switched to freelance work (which makes it possible but less likely for a Bay design to be by Mans). someone who goes on tv and says a particular item is interesting (more on that eventually in a Roth entry). We say that beauty is in the eye of the beholder, but I believe that the beholder has a responsibility to train that eye. Collect what you want, but respect and appreciate it for what it is, good, bad, or indifferent, and consider developing that eye and becoming a better beholder who isn’t beholden to a name. If you got here without going to the main site, you can get there by clicking here: ginforsodditiques.com. 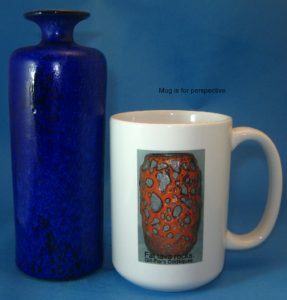 You’ll find more information plus items for sale…….not just the usual suspects. 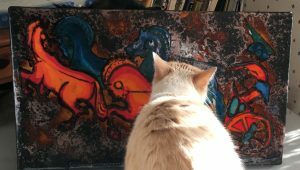 Of course, there’s a lot more to read in the blog. If you don’t have time now, please come back when you can. Meanwhile, tell your friends. Ummm, I’d be beholden if you do.